How We Can Reconnect Center City North? For over a century North Philadelphia has been cut off from Center City. First by the Reading Viaduct in the 1890s creating the ‘Chinese Wall’ - a 10 block barrier between the two districts. 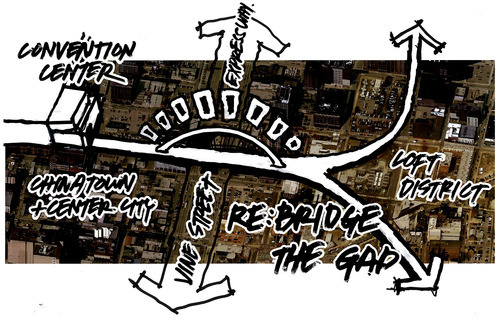 By 1960s, Robert Mitchell and Ed Bacon’s urban renewal efforts were in full force and the Vine Street Expressway dramatically exacerbated the physical barrier and furthered the perceived gap between the city and it’s northern edge. In order to make way for the 8 lane thoroughfare the highway engineers severed the viaduct from Vine St southward. In 2008, as if we hadn’t learned from the Viaduct or the Expressway, the City of Philadelphia expanded the mammoth Convention Center westward - stretching three full city blocks. By it’s completion ‘The Wall’ between North and South had solidified. Some would think that massive barriers like these are only created during times of war and political unrest. Not only was the neighborhood on the wrong side of the tracks (and a depressed highway) but the city literally turned it’s back to its northern neighborhoods.